← What Can We Learn from Butterfly? We are having such rich discoveries in our wisdomkeepers space, supporting one another in expressing our true selves and our highest potential in this world. I know this round brought a very limited enrollment time frame and we all have so much to choose from. Keep in mind that we will have another at the summer solstice. If you’d like to stay informed, you can subscribe here. Last week we heard from butterfly wisdom. This week, we will share our discoveries from Lion. One of the themes of wisdomkeepers is “leadership.” Mountain lion roars among our spirit animals, our medicine teachers, and calls us forth. Lions lead without insisting that others follow. We are all lions, and we understand that we are all leaders. As we grow from cub to proud Lion/ess, we practice power with integrity. We balance our mind, body, spirit. From a place of sovereignty, of no-neediness, we never manipulate or control others. We bear our balanced medicine shield and just Show Up. Our power emerges from within, never at the expense of others. However, we may be blamed by others when things go wrong or for taking charge when others don’t, so it’s not the easy path. Authenticity is huge! We may courageously challenge our personal beliefs to come to deeper truths within. Then we Live them, Speak them. We may find our dreams huge and scary, but calling us forth nonetheless. We may struggle with visibility, transparency, vulnerability, but we have no choice but to Show Up. And so goes the unfolding in our wisdomkeepers space, as we prepare for our gathering at the equinox… such richness and depth of experience… so many ways we show up as leaders. “Responsibility is no more than the ability to respond to any situation. Panic is not part of sacred medicine.” So says, Jamie Sams & David Carson in Medicine Cards. What is power to you? Integrity? Leadership? Who do you BE? Who are you Becoming? For our need is NOW. 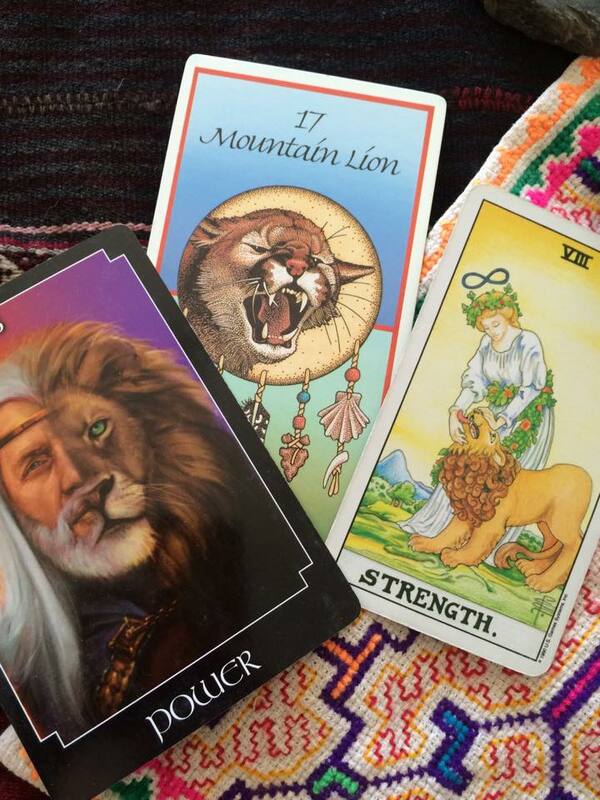 This entry was posted in Community, Conscious Evolution, Relating, Spirituality and tagged animal spirits, archetypes, integrity, leadership, medicine animals, mountain lion medicine, Tarot. Bookmark the permalink.